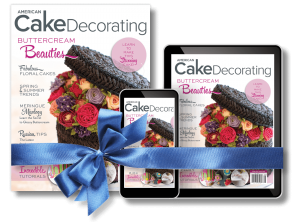 Our Holiday issue contributor Victoria Perry of Midnight Cravings Bakery shares a delectable recipe for a tiramisu cake! 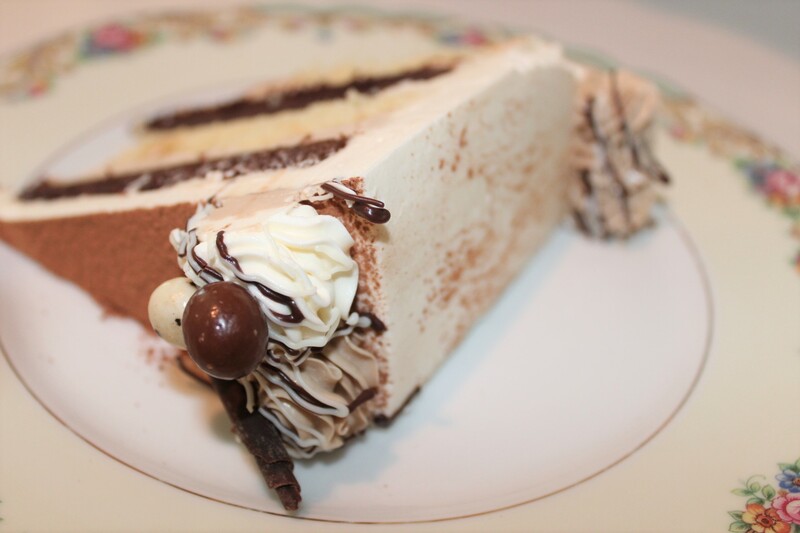 This scrumptious dessert layers coffee-soaked vanilla bean and chocolate cake with Italian meringue buttercream and dark chocolate ganache! 1. Using an 8” cake pan as a guide, cut 2 layers of vanilla bean and 2 layers of chocolate cake from the fully cooled cake sheets. Set aside. 2. In a mixing bowl with a whisk attachment, take 3 cups of the Italian buttercream and the Espresso powder and mix on low speed until the espresso is fully incorporated. This is the Espresso buttercream you will use as a filling in steps 4 & 9. 3. Place 1 vanilla bean layer on an 8” cardboard, drizzle ½ cup of the coffee onto the cake layer and let it soak into the cake. 4. Put half of the espresso buttercream on top and spread evenly using an offset spatula. 5. Place a chocolate cake layer on top, drizzle ½ cup of the coffee onto the cake. 6. Pour a thin layer of the ganache on the cake and spread evenly with a spatula. 7. Put 1.5 cups of the Italian buttercream on top of the ganache and spread out evenly. 8. 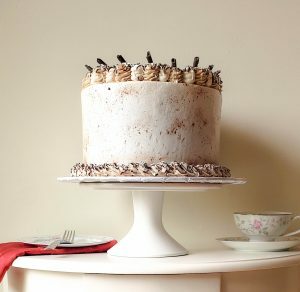 Place the second vanilla bean cake layer on top, and drizzle with coffee. 9. Layer with the remaining espresso buttercream. 10. 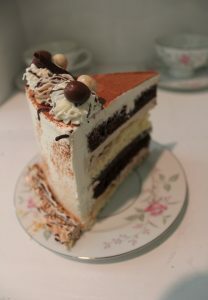 Top with the second layer of chocolate cake, drizzle with the remaining coffee. 11. Crumb coat and place in the fridge for 30 minutes. 12. Place some of the Italian buttercream in a pastry bag with a Wilton 1M star tip. Set aside. 14. Transfer cake to the 12” cake board. Refrigerate cake for 30 minutes to harden buttercream. 15. 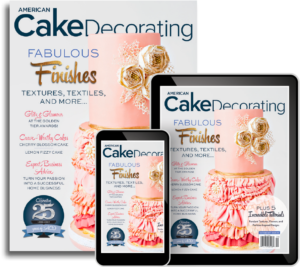 Using the pastry bag, create 16 evenly spaced swirls on the top of the cake, and then a shell border around the bottom of the cake. 16. In separate microwave safe containers, melt some of the dark chocolate wafers and the white chocolate wafers according to the directions on the bag. 17. Place the chocolates into small parchment cones, or you can do the following step using a spoon. 18. Drizzle dark chocolate over the buttercream borders. Then drizzle the white chocolate. 19. Place a garnish on each of the 16 top swirls. I prefer to use chocolate curls or chocolate covered espresso beans. 20. Using a cocoa sifter, dust cocoa powder onto the tops and sides of the cake. 21. Cut, serve, and savor! 1. In a mixing bowl using the paddle attachment, cream the butter, sugar, salt, and vanilla bean paste until the mixture is light and fluffy. 2. Slowly add in the eggs a little at a time. After each addition, beat the eggs until they are absorbed before adding more. After the eggs are beaten in, mix until light and fluffy. 3. Scrape down the sides of the bowl to ensure even mixing. 4. Add the sifted dry ingredients, alternating with the liquids. This is done as follows: Add 1/4th of the dry ingredients. Mix until blended. Add 1/3rd of the liquid. Mix just until blended. Repeat until all ingredients are used. Scrape down the sides of the bowl occasionally for even mixing. 5. Spread batter into a half sheet pan that is sprayed with pan spray and lined with parchment paper. 6. Bake @350 for 20-30 minutes or until a cake tester inserted comes out clean. Edges of cake should be golden and start to pull away from the pan. 1. In a mixing bowl using the paddle attachment, cream the butter, sugar, and salt until the mixture is light and fluffy. 2. Slowly add in the melted chocolate. 3. Slowly add in the eggs a little at a time. After each addition, beat the eggs until they are absorbed before adding more. After the eggs are beaten in, add in the vanilla extract and mix until light and fluffy. 4. Scrape down the sides of the bowl to ensure even mixing. 5. Add the sifted dry ingredients, alternating with the liquids. 6. Spread batter into a half sheet pan that is sprayed with pan spray and lined with parchment paper. 7. Bake @350 for 20-30 minutes or until a cake tester inserted comes out clean. Edges of cake should be golden and start to pull away from the pan. 1. In a small saucepan over medium heat, bring sugar and 1 1/3 cup water to a boil. Continue boiling until syrup reaches 238 degrees on a candy thermometer (do not stir mixture). 2. Meanwhile, place egg whites in the bowl of a standing mixer fitted with the whisk attachment and beat on low speed until foamy. Then beat on medium-high speed until stiff but not dry; do not over beat. 3. With mixer running, add syrup to whites in a slow steady stream, beating on high speed until no longer steaming, about 3-5 minutes. Reduce speed and slowly begin to add butter bit by bit, until all butter is incorporated, and mixture is back to a light and fluffy consistency. Beat in vanilla and Grand Marnier. If icing curdles, keep beating until smooth. 1. In a small stockpot, heat cream just to a boil over medium-high heat. 2. In a metal bowl, pour the cream over the chocolate. 4. Stir with a whisk until smooth and shiny to emulsify the cream and chocolate. 5. Make sure to scrape down the sides and bottom of the bowl to ensure all chocolate is incorporated. 6. Let cool to room temperature. Set aside. Since my childhood I have always loved to bake for friends and family. My first ever wedding cake was for my eldest sister in 2005. After that I decided I wanted to attend culinary school to become a chef. I enrolled at Baker college of Muskegon in 2006 and began my journey. At Baker I fell in love with making fresh breads, tortes, and chocolates, and new I needed to continue that passion. When Baker became the Culinary Institute of Michigan, I jumped into the Baking and Pastry certificate program. While attending Baker, one of my teachers told our class about a job opening at a company in Grand Rapids. The position was a cater chef for the Gilmore Collection at The B.O.B. I applied, and received the position, worked my way up the ranks to become the lead baker for the B.O.B. and for the catering department. I have worked various jobs in the culinary industry, including a line cook, cater chef, baker, cake artist, pastry chef, waitress, prep cook. The Bob, Above and Beyond catering, Mirabella Confections, and The Amway Grand Plaza Hotel are where I have perfected my skills and become the chef I am today. I’ve worked hard to get to where I am. Being able to open my own business has been the dream, and I am slowly working my way towards my goal of a brick and mortar shop in the Grand Rapids area. I see big things in the future for Midnight Cravings Bakery, and with the support of my family and friends my dreams will become a reality.